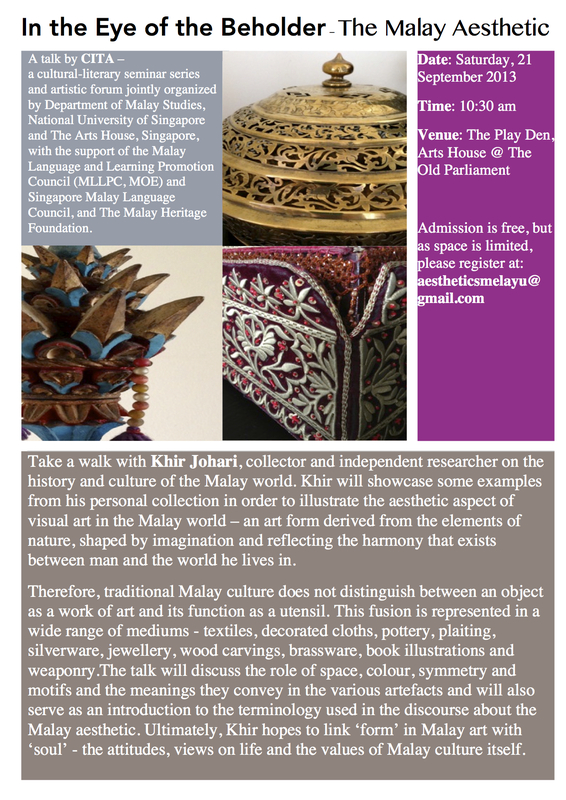 Take a walk with Khir Johari, collector and independent researcher on the history and culture of the Malay world. Khir will showcase some examples from his personal collection in order to illustrate the aesthetic aspect of nature, shaped by imagination and reflecting the harmony that exists between man and the world he lives in. Therefore, traditional Malay culture does not distinguish between an object as a work of art and its function as a utensil. This fusion is represented in a wide range of mediums – textiles, decorated cloths, pottery, plaiting, silverware, jewellery, word carvings, brassware, book illustrations and weaponry. The talk will discuss the role of space, colour, symmetry and motifs and the meanings they convey in various artefacts and will also serve as an introduction to the terminology used in the discourse about the Malay aesthetic. Ultimately, Khir hopes to link ‘form’ in Malay art with ‘soul’ – the attitudes, views on life and the values of Malay culture itself.